"With a Brush Stroke so Soft, She was Transformed into the most beautiful sight, eyes had ever seen." It can be intimidating at times going into a beauty store and trying to pick the best makeup brushes for you. With all these options and little explanations on what to use them for, you can feel challenged. 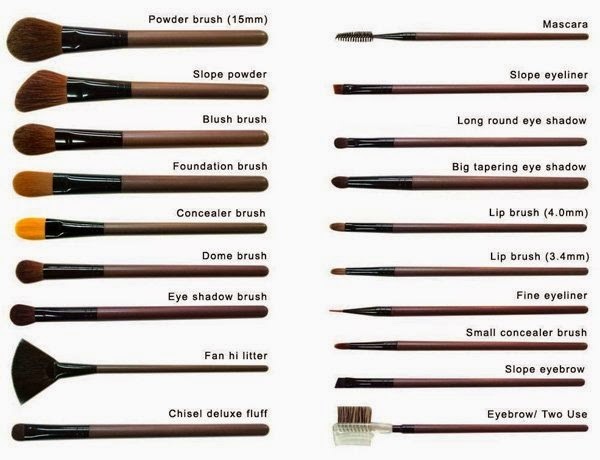 However, this is understandable since not many people really know the functions of each and every brush. 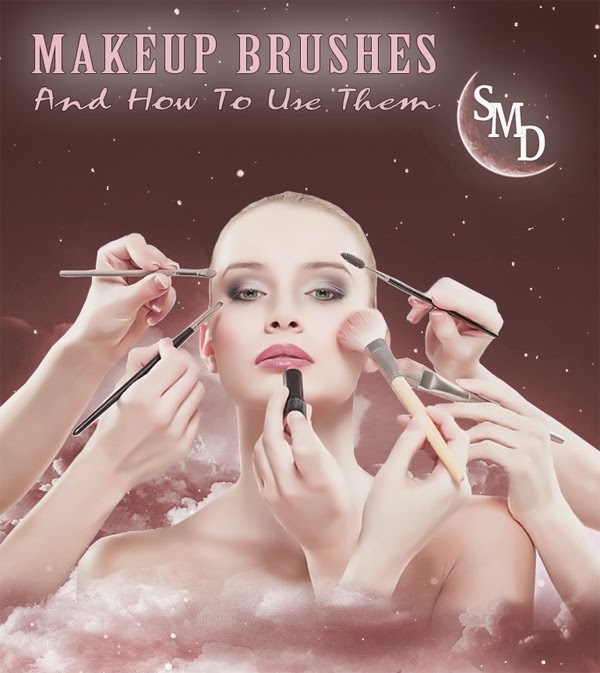 To help you through some of your choices, I have gone ahead and explained some of the common makeup brushes for you. This is a large, round and soft natural brush used to dust setting powders or foundation powders on your face. It uses less product as is the case with puff and also gives a more even and natural looking finish. In regards to your face powder, dip the brush into the mixture and tap off the excess, in a sweeping motion, brush lightly over the skin in a Downwards motion as you follow the natural face contours. As you want to apply the blush on the cheek bones, this does not mean you should brush your brush in a upwards motion, which is a Big NO NO! You either make very gentle and circular motion, or dap it on in a downwards motion. NOTE: The reason why you should put on any face powder in a downwards motion, is because we (98% of us) actually have small hair on our faces. This means that when you move the brush in a upwards motion, you are actually raising your hair, and when you brush in a downwards motion, you are laying them down. Actually there are a lot of different eye shadow brushes out there. One can be a stiff, flat and small natural brush used in application of allover eye shadow color, giving your lids a good finish and intense pigmentation than the case of a fluffier. brush. Use this brush to sweep the shadow over the lids, usually outwards from the inside of the eye. But this really depends on what look you want. Another eye shadow brush that is among my and many others favorites, is the blending brush. This brush is used for smokey eyes of any kind, smokey eyes is about blending. This is a soft natural brush that is flower-shaped and is the ultimate brush for the eyes since it can get deep in the crease of your eyes defining your lids with precision. Use the tip and dip it into your eye shadow as you use circular motions followed by tapping off your product. Start on the outer edge of your eye using the tip of the brush blending forwards and backward through the crease with the use of windshield wiper action. This is a small angled synthetic or natural brush and since it can also be used on your lash line for the eyeliner, it serves with multi-purpose and it can also be used on your brow in order to fill it in. When applying, place the brush on the inner corner or side of your eye and press into lash line, “walking” it across creating a perfect line. This is a flat, round-tipped, small makeup brush made for a defined lip as it will aid a precise lip coloring more easy. On use, the brush should be covered with lipstick after lining your lips and then start at the lips center blending out the edges. This brush is typically short with flat bristles or wide round. It is commonly used to apply mineral powder or in some cases a cheek bone blush, using a circular movement to buff the powder into your skin. Again I suggest that you also move the brush in a downwards motion when applying a blush with a Kabuki brush. This brush can be used for the entire face, yet small enough to add some softness to the eyelids. It also works well in lifting excess product from the skin. You can use this tool for both your brows and eyelashes. The brush will allow you to smooth your brows down and the comb side can also be used to get clumps out of your lashes. A blending brush is also among the common makeup brushes and should be used once you have applied all of your face makeup. It will blend it all together giving your face an airbrushed effect.